We are always accepting donations, please see the donation page and thank you for your support! Bracelets - Free - Contact us for bracelets. Fifth Annual Marcus Ford Run/Walk 5K Celebration - October 14, 2017! Dr. Amy Hunter, DDS in Christiansburg, VA has donated to Marcus' scholarship each year. Scentsy Fundraiser for Marcus' Scholarship - 2nd year! Thank you Mary Nagle! 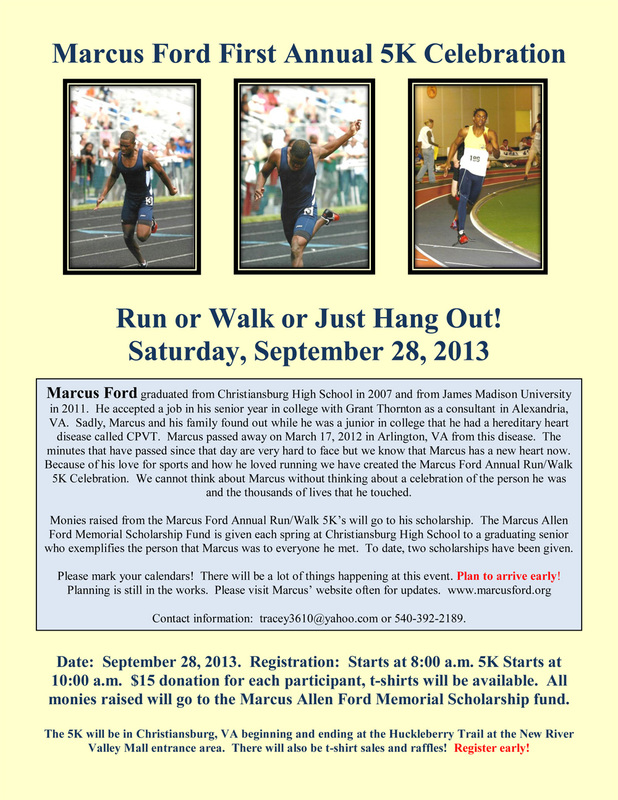 Second Annual Marcus Ford 5K Walk/Run Celebration October 11, 2014! Thank you! This event was held in Christiansburg, Va at the Huckleberry Trail New River Valley Mall entrance area. Thank for all of the support everybody continues to show! Grant Thornton LLC - Jeans Day - $1500 Raised for The Marcus Allen Ford Scholarship! On June 7th and June 14th, the Grant Thornton Community in Alexandria, VA and Texas held two Jeans Days to raise funds in honor of Marcus Ford. On both days, employees were given the opportunity to donate money in memory of Marcus and wear jeans to work. All funds that were raised over the two weeks will be donated to The Marcus Allen Ford Memorial Scholarship at Christiansburg High School. A very special Thank You to Mary Nagle fort her Scentsy fund raiser - She raised $337.55 for the Marcus Ford Memorial Scholarship! Falling Branch Elementary School - raised $1,290.52 for the Marcus Ford Memorial Scholarship by doing a walk with the children! James Madison University's Celebration of Life - raised $536 for the Marcus Ford Scholarship through raffles and donations at their annual Marcus Ford Celebration! ONeil's Grill in Harrisonburg, VA - raised $274 for the Marcus Ford Scholarship by donating 20% of the proceeds from food and non -alcoholic beverages for one evening. Bracelet Sales - Thank you to everyone who has purchased a Marcus bracelet. We have them in all 50 of the Untied States and in several countries! Contact us for your bracelet! So far we have raised almost $2,000 in bracelet sales and donations. Thank you!